Objectives To summarise the evidence about the efficacy of a Mediterranean diet on the management of type 2 diabetes and prediabetic states. Design A systematic review of all meta-analyses and randomised controlled trials (RCTs) that compared the Mediterranean diet with a control diet on the treatment of type 2 diabetes and prediabetic states was conducted. Electronic searches were carried out up to January 2015. Trials were included for meta-analyses if they had a control group treated with another diet, if they were of sufficient duration (at least 6 months), and if they had at least 30 participants in each arm. A random-effect model was used to pool data. Participants Adults with or at risk for type 2 diabetes. Interventions Dietary patterns that described themselves as using a ‘Mediterranean’ dietary pattern. Outcome measures The outcomes were glycaemic control, cardiovascular risk factors and remission from the metabolic syndrome. Results From 2824 studies, 8 meta-analyses and 5 RCTs were eligible. A ‘de novo’ meta-analysis of 3 long-term (>6 months) RCTs of the Mediterranean diet and glycaemic control of diabetes favoured the Mediterranean diet as compared with lower fat diets. Another ‘de novo’ meta-analysis of two long-term RCTs showed a 49% increased probability of remission from the metabolic syndrome. 5 meta-analyses showed a favourable effect of the Mediterranean diet, as compared with other diets, on body weight, total cholesterol and high-density lipoprotein cholesterol. 2 meta-analyses demonstrated that higher adherence to the Mediterranean diet reduced the risk of future diabetes by 19–23%. Conclusions The Mediterranean diet was associated with better glycaemic control and cardiovascular risk factors than control diets, including a lower fat diet, suggesting that it is suitable for the overall management of type 2 diabetes. It is the first attempt to summarise the evidence about the efficacy of a Mediterranean diet on the management of type 2 diabetes and prediabetic states. The statistical power of our attempt is supported by the relevant number of meta-analyses (8) and long-term randomised controlled trials (3). Heterogeneity was low in the primary analysis of a Mediterranean diet and glycaemic control of type 2 diabetes. We need more data whether a Mediterranean diet can be translated to other populations and if similar levels of adherence to this eating pattern can be achieved. In type 2 diabetes, the use of a Mediterranean diet was associated with lower glycosylated haemoglobin levels and improved cardiovascular risk factors, as compared with control diets, mainly lower fat diets. The aim of this study was to summarise published data on the Mediterranean diet and management of type 2 diabetes and metabolic states at increased risk of future diabetes, including IFG, IGT and metabolic syndrome. We therefore (1) did a systematic review of published meta-analyses of randomised controlled trials (RCTs) that assessed the role of the Mediterranean diet on the management of type 2 diabetes and prediabetic states; (2) did ‘de novo’ meta-analyses on the same topic including new findings from RCTs and (3) did a convergence analysis of prospective studies and RCTs to assess whether the prevention and management of type 2 diabetes by the Mediterranean diet were concordant. This study of a systematic review and meta-analysis is in compliance with the guideline PRISMA (Preferred Reporting Items for Systematic reviews and Meta-Analyses).11 We carried out this systematic review in accordance with the study protocol (see online supplementary material). A PRISMA statement is attached to follow the reporting of this systematic review. A literature search of PubMed, Google Scholar, Cochrane Library and ClinicalTrials.gov was conducted for meta-analyses and RCTs published up to 31 January 2015 which focused on the Mediterranean diet and treatment of type 2 diabetes or prediabetic states. We also included in the search meta-analyses of prospective cohort studies of the Mediterranean diet and prevention of type 2 diabetes. Studies published ahead of print at 31 January 2015 were also included. The main search terms used were ‘Mediterranean diet’, ‘type 2 diabetes’, ‘prevention of type 2 diabetes’, ‘prediabetes’, ‘metabolic syndrome’, ‘obesity’, ‘impaired glucose tolerance’, ‘impaired fasting glucose’, ‘clinical trials’ and ‘cardiovascular risk factors’. A full search string for PubMed is reported in the online supplementary material. We identified full-text articles written in English. We also searched the reference lists of identified articles for further papers. Previous reviews and editorials from peer-reviewed journals were used in synthesising data. After the initial screening of titles and abstracts, the studies included by both reviewers were compared; disagreement was resolved by consensus. The inter-review agreement was calculated with к statistics. We included all meta-analyses focused on the Mediterranean diet and treatment of type 2 diabetes and prediabetic states. We also included RCTs focused on the same topic, if they were not included in previous meta-analyses or if they were to be used for further meta-analyses (‘de novo’). We also included all meta-analyses of the Mediterranean diet and prevention of type 2 diabetes. In a conservative approach, trials were included for ‘de novo’ meta-analyses if they had a control group treated with another diet, if they were of sufficient duration (at least 6 months), if they had at least 30 participants in each arm, and if they described themselves as using a ‘Mediterranean’ dietary pattern. We assessed the design, execution and reporting of the included RCTs according to the Cochrane risk of bias tool.12 We assessed risk of bias in random sequence generation and allocation concealment (selection bias), blinding of participants and personnel (performance bias), blinding of outcome assessment (detection bias), incomplete outcome data (attrition bias) and selective reporting (reporting bias). The risk of bias was deemed high, low and unclear. The quality of each RCT was assessed by one reviewer and verified by another reviewer. Disagreement was resolved by discussion. The quality of the body of evidence of each meta-analysis was assessed by the GRADE approach.13 Each evaluated factor was rated as high, moderate, low or very low. A serious risk of bias was defined as present when an individual study had more than three unclear or high risks of bias, and imprecision was defined as a meta-analysis CI >0.5. We did a convergence analysis to see whether the Mediterranean diet could affect the prevention and management of type 2 diabetes in a similar way. In a conservative approach, we graded the level of evidence as good when the results of both prospective studies on diabetes prevention and RCTs on glycaemic control of diabetes were both positive (the Mediterranean diet can not only reduce the incidence of future diabetes, but also improve the glycaemic control of type 2 diabetes better than control diets). We summarised the results of previous meta-analyses with the Mediterranean diet. We did ‘de novo’ meta-analyses of RCTs with the Mediterranean diet according to inclusion criteria: one meta-analysis assessed changes in glycosylated haemoglobin (HbA1c) in type 2 diabetes, and another assessed the probability of remission from the metabolic syndrome. Regardless of whether a trial presented two arms of the Mediterranean diet compared to one control diet, we preliminary pooled data from the two interventional arms with a Mediterranean diet in order to avoid distortion of the 95% coefficient intervals of the final estimate. In a conservative approach, the random-effects model, which allows for variation of true effects across studies, was taken as ‘main results’.14 Heterogeneity was assessed by using the Q statistic and I2, which is the proportion of total variance observed between the trials attributed to the differences between trials rather than to sampling error.15 I2<25% was considered as low in heterogeneity and I2>75% as high in heterogeneity. Possible publication bias was assessed using a contour-enhanced funnel plot of each trial's effect size against the SE. Funnel plot asymmetry was evaluated by Begg and Egger tests. All statistical analyses were performed using Stata V.11.0 software (Stata, College Station, Texas, USA). Significance was set at p<0.05, and 95% CIs are quoted throughout. We identified 2824 studies in database searches (figure 1). Of these, 2680 were excluded based on the title and abstract, leaving 144 articles for further full text evaluation. One hundred and thirty of these studies were excluded, most of them focusing on components of the Mediterranean diet only, RCTs not in agreement with inclusion criteria or already covered by published meta-analyses. Therefore, eight meta-analyses16–23 and five RCTs24–28 were eligible. Agreement between observers on which studies to include was good: the к scores for agreement between the two reviewers were 86% after screening titles and abstracts, and approached 100% after screening full-text articles. Flow diagram of literature search to identify meta-analyses and randomised controlled trial evaluating the effect of Mediterranean diet in type 2 diabetes and prediabetic states. The characteristics of the eight included meta-analyses and the five RCTs are summarised in table 1. The meta-analyses were published from 2011 to 2014, with half of them published in 2014. Six meta-analyses16–21 reported RCTs of the Mediterranean diet as compared with other diets, and considered as outcomes HbA1c, body weight, total cholesterol and high-density lipoprotein (HDL) cholesterol; three of these meta-analyses18 ,20 ,21 included RCTs performed on patients with type 2 diabetes only, and the other three16 ,17 ,19 included RCTs performed on a mixed population. Two meta-analyses22 ,23 included mostly prospective cohort studies on adherence to the Mediterranean diet and incidence of future diabetes. Two RCTs24 ,25 specifically investigated the effect of the Mediterranean diet, as compared with a control diet, on the remission from metabolic syndrome in people with or without type 2 diabetes at baseline; the other three RCTs26–28 assessed the effect of the Mediterranean diet on glycaemic control of diabetes. All the RCTs satisfied the strict inclusion criteria. Besides evaluating remission of metabolic syndrome by the Mediterranean diet,25 the PREDIMED trial also assessed the effect of two Mediterranean diets on diabetes incidence.29 We did not find any RCT that specifically addressed the effect of the Mediterranean diet in people with either IGT or IFG that satisfied the inclusion criteria. The individual quality of the five RCTs revealed a low risk of bias for most evaluated domains, except for blinding of participants and personnel, which, owing to the inherent characteristics of the dietary studies, was marked as unclear (see online supplementary figure S1). Most RCTs described some type of assessment of diet compliance. The GRADE quality of evidence was mostly moderate for the meta-analyses (see online supplementary table S1). We did a meta-analysis of long-term clinical trials of the Mediterranean diet and glycaemic control in type 2 diabetes (figure 2, top panel). We found three interventional trials,26–28 with four arms, as Elhayany et al27 compared two different Mediterranean diets with the same control diet. The results show an overall effect estimate for HbA1c of −0.47% (95% CI −0.56 to −0.38) favouring the Mediterranean diet, as compared with the usual care26 or a low-fat diet,27 ,28 with no heterogeneity (I2=3.5%). The Egger tests were not calculated due to the small number of included studies. Figure 3 (top panel) shows a summary of the four meta-analyses18 ,20 ,21 (+ that reported in figure 2) of the Mediterranean diet and glycaemic control in type 2 diabetes. All the four analyses favour the Mediterranean diet, with a greater HbA1c reduction, ranging from −0.3% to −0.47%, as compared with the control diet. The absence of heterogeneity in the meta-analysis of figure 2 (top panel), as compared with other meta-analyses in figure 3 (top panel), may be related to the strict entry criteria we adopted for selecting RCTs. 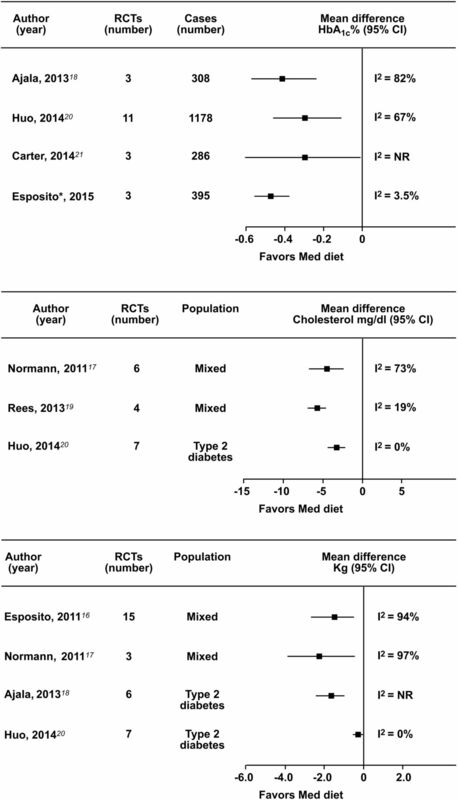 Meta-analysis of three long-term RCTs of Mediterranean diet and glycaemic control of diabetes (top panel). The two arms in the RCT by Elhayany were preliminary pooled. 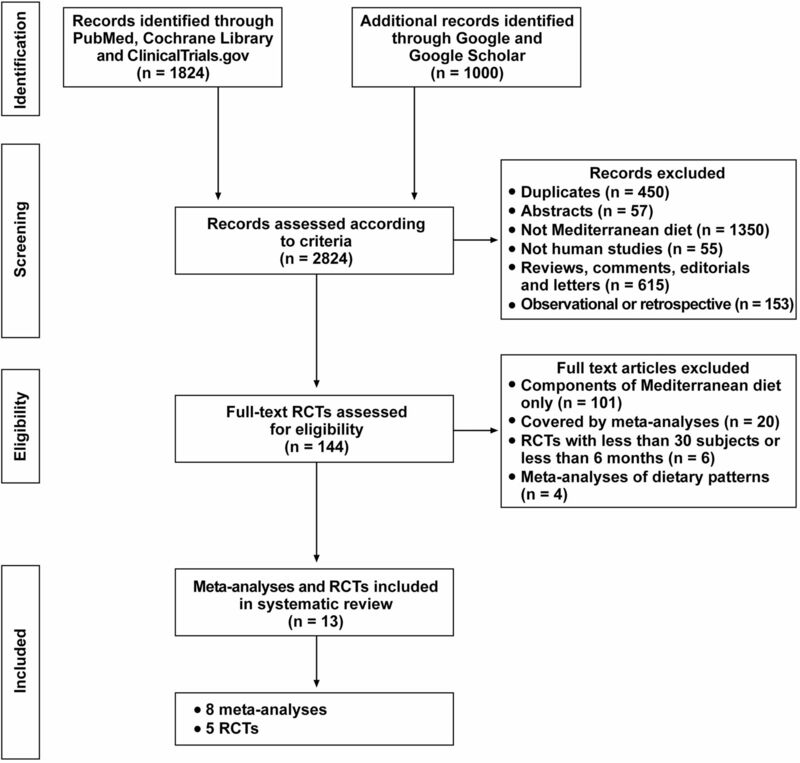 Meta-analysis of metabolic syndrome regression by Mediterranean diet (bottom panel). The two arms in the RCT by Babio were preliminary pooled (HbA1c, glycosylated haemoglobin; RCT, randomised controlled trial). Summary of meta-analyses of Mediterranean diet and HbA1c (top panel), total cholesterol (middle panel) and body weight (bottom panel). *This meta-analysis refers to figure 2 (top panel; HbA1c, glycosylated haemoglobin; RCT, randomised controlled trial). Five meta-analyses16–20 included RCTs which assessed cardiovascular risk factors. In The Cochran review of Rees et al,19 seven RCTs described the intervention as a Mediterranean diet, and only four RCTs provided sufficient data on cholesterol levels for being meta-analysed. Heterogeneity precluded meta-analyses for other outcomes. The meta-analyses of Nordmann et al17 and Esposito et al16 included RCTs comparing the Mediterranean diet with low-fat diets in overweight/obese individuals, including patients with type 2 diabetes. Three meta-analyses17 ,19 ,20 reported the effect on total cholesterol (figure 3, middle panel): the reduction in total cholesterol was statistically significant with the Mediterranean diet as compared with control diets, and ranged from −5.420 to −8.9 mg/dL.19 Two of these meta-analyses19 ,20 had low heterogeneity. Four meta-analyses16–18 ,20 reported the effect on body weight. Figure 3 (bottom panel) shows that all meta-analyses found a significant reduction in body weight with the Mediterranean diet, as compared with control diets, ranging from −0.2920 to −2.2 kg;17 heterogeneity was low in the meta-analysis of Huo et al.20 Two meta-analyses18 ,20 also found a significant increase in HDL cholesterol with the Mediterranean diet, as compared with control diets (table 1). Two RCTs24 ,25 specifically evaluated the relationship between a Mediterranean diet and metabolic syndrome regression. The results (figure 2, lower panel) indicate that participants with the metabolic syndrome allocated to a Mediterranean diet, as compared with those following a control diet, had a 49% (95% CI 14% to 96%) increased probability of remission from metabolic syndrome during a follow-up of 2–5 years. Two meta-analyses22 ,23 assessed the relationship between adherence to a Mediterranean diet and incidence of future diabetes. The analyses are consistent with a significant reduction, ranging from 19% to 23%, of new diabetes associated with greater adherence to the Mediterranean diet (table 1). So far, only one long-term RCT29 provided evidence that a Mediterranean diet reduced the development of type 2 diabetes. The convergence analysis was positive that: (1) a Mediterranean diet can prevent type 2 diabetes (evidence from 2 meta-analyses of prospective cohort studies and 1 long-term RCT) and (2) a Mediterranean diet is better than a control diet in reducing HbA1c levels in type 2 diabetes (evidence from 4 meta-analyses of RCTs). Current evidence indicates that the Mediterranean diet is effective in improving both glycaemic control and cardiovascular risk factors in people with type 2 diabetes, and should therefore be considered in the overall strategy for management of people with diabetes. The convergence analysis of prospective studies and interventional trials was satisfied: the Mediterranean diet is able to reduce the incidence of future diabetes by 19–23%. A significant reduction of type 2 diabetes has been found to be associated with greater consumption of healthy dietary patterns, including the Mediterranean diet, the DASH (Dietary Approach to Stop Hypertension) diet, the AHEI (Alternative Healthy Eating Index) and various a posteriori defined prudent/healthy dietary patterns, derived by factor or cluster analysis.32 All the protective dietary patterns, including the vegetarian diet,33 present many similarities with the Mediterranean diet, since they are mostly plant-based and include a high consumption of whole-grain foods, fruit and vegetables. In the PREDIMED trial,29 3541 patients without diabetes at high cardiovascular risk were randomly assigned to education on either a low-fat diet or to one of two Mediterranean diets, supplemented with either free virgin olive oil (1 L/week) or nuts (30 g/day). After a 4.1-year follow-up, participants assigned to the two Mediterranean diets without calorie restriction had a 40% (significant) and 18% (non-significant) reduction, respectively, in the risk of diabetes compared with a low-fat control diet. All meta-analyses so far published, including the one presented here in figure 2 (top panel), are concordant and indicate that the Mediterranean diet, as compared with control diets, may reduce HbA1c levels by 0.30–0.47%, which is not banal in the overall management of type 2 diabetes. Although not satisfying the inclusion criteria (<30 patients for each arm), the study of Shai et al34 also showed a HbA1c reduction of 0.5±1.1% among obese participants with diabetes at 24 months. 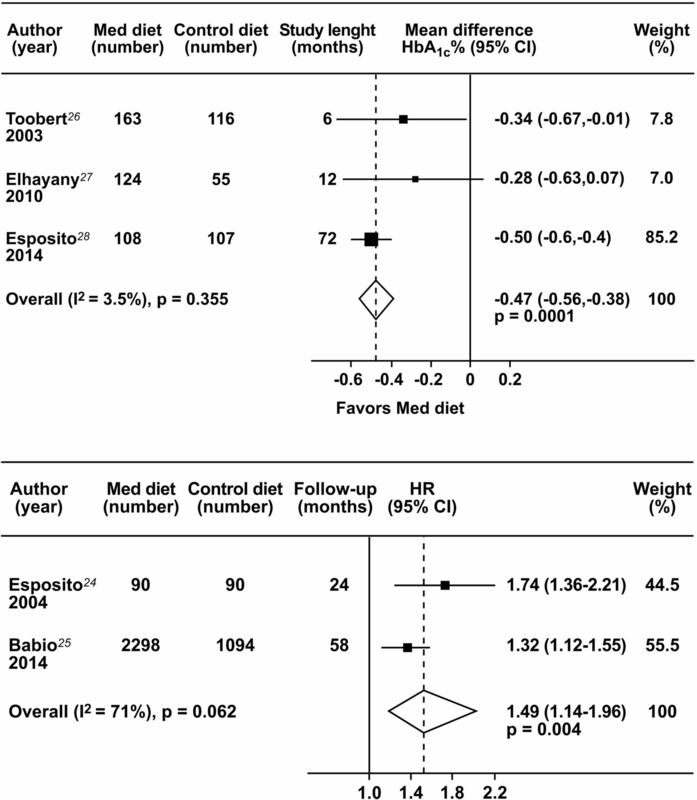 Regardless of whether they were reported, fasting glucose level also improved with the Mediterranean diet: in the meta-analysis of Huo et al,20 the decrease of fasting plasma glucose was 13 mg/dL greater with Mediterranean diets than control diets. The metabolic syndrome can be considered a prediabetic state.42 ,43 Current evidence from RCTs indicates that the Mediterranean diet confers a 49% increased probability of remission from metabolic syndrome in a long-term follow-up. Three prospective studies44–46 evaluated the role of the Mediterranean diet in the prevention of metabolic syndrome and found that higher adherence to the Mediterranean diet was associated with reduced risk of developing metabolic syndrome ranging from 15%45 to 80%.44 However, one large clinical trial25 failed to find an association between the Mediterranean diet and incident metabolic syndrome. This review has limitations. One limitation relates to the low number of original trials of long duration on the Mediterranean diet and diabetes control. However, all three trials26–28 so far published show similar results with no heterogeneity, giving support to the robustness of the findings, and in part balancing the possibility of low statistical power of meta-analysis including a limited number of trials. Moreover, consistency across these studies on the definition of the Mediterranean diet varies, including the use of olive oil as the main source of dietary fat. However, the results all show a reduction of HbA1c with the Mediterranean diet, as compared with control diets, suggesting that similarities across different definitions of the Mediterranean diet prevail on marginal differences. Moreover, some meta-analyses,19 although judged to be of moderate/good quality by current GRADE testing, may be biased by the exclusion of some relevant studies. Another possible limitation of this review includes the need to find the optimal strategies for educating individuals with type 2 diabetes and to improve adherence to the Mediterranean diet. Living in a neighbourhood rich in resources for physical activity and healthful foods compared with living in an environment not encouraging a healthy lifestyle is associated with a 38% lower incidence of type 2 diabetes.50 Further research is also needed to determine if the study results with the Mediterranean diet can be translated to other populations and if similar levels of adherence to this eating pattern can be achieved. A further issue relates to the macronutrient composition of the Mediterranean diet. A carbohydrate content of less than 50% of daily energy is associated with benefits on diabetes incidence,29 glycaemic control of diabetes,27 ,28 and cardiovascular outcomes39 in RCTs. A reduced carbohydrate content also fits with the abundant use of monounsaturated fat (about 20%), mainly olive oil, used in the trials with a Mediterranean diet. At present, the Mediterranean diet with a moderately lower carbohydrate content best fits with the results of RCTs in individuals with or at risk for type 2 diabetes. Lastly, despite country-specific variations in the foods consumed, which have also changed over time, there are commonalities in food groups and their frequency of consumption that characterise the Mediterranean diet (see online supplementary table S2). In conclusion, in patients with type 2 diabetes, the use of the Mediterranean diet was associated with lower HbA1c levels and improved cardiovascular risk factors, as compared with control diets, mainly lower fat diets. The present available evidence suggests that the Mediterranean diet is a dietary pattern suitable for the overall management of type 2 diabetes. Unesco inscribed the Mediterranean diet in 2010 and again in 2013 on the list of the Intangible Cultural Heritage of Humanity (http://www.unesco.org/culture/ich/index.php?lg=en&pg=00011&RL=00884). International Diabetes Federation. IDF diabetes atlas (6th edn.) 2013. http://www.idf.org/diabetesatlas (accessed 10 Feb 2015).
. Statistical methods for examining heterogeneity and combining results from several studies in meta-analysis. In: Egger MD-SG, Altman DG, eds. Systematic reviews in health care. London: BMJ Publishing, 2001: 285–312.
. Mediterranean diet for primary prevention of cardiovascular disease. N Engl J Med 2013;369:674–5. Contributors KE and DG designed the protocol and the methods. PC and DG carried out the statistical analyses. All the authors contributed to data extraction, drafting of the article and approved the final version of the manuscript. Funding This study was funded in part with support from the Second University of Naples and the ‘Salute con Stile’ Association.